Our award winning designed caffe is located in the heart of the financial district of downtown Vancouver. We are located on the south side of Dunsmuir Street in between Howe and Hornby Streets and only steps away from the Metropolitan, Four Seasons, Hyatt and Le Soleil Hotels. 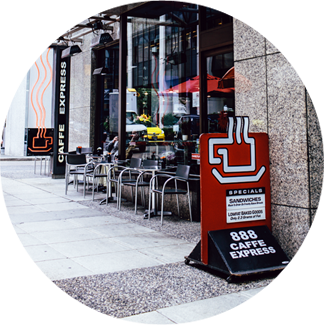 Caffe Express is locally owned and operated and has been successfully serving the downtown core since 1992.